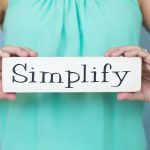 After simplifying my own life, my mission turned to guiding business and residential clients how to simplify and enjoy fuller, more abundant and meaningful lives. Not just cluttered rooms and desks…..but cluttered relationships, obligations, schedules, perceptions… it all has a profoundly negative effect on our health and well-being. I’ve seen first hand how transforming your surroundings & space with better systems, flow and functionality can absolutely transform your overall life. Isn’t it time for you to start living the simplified life?